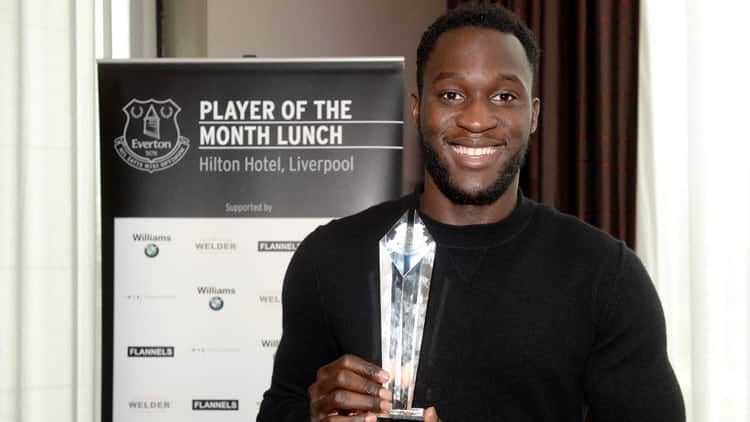 Romelu Lukaku has been named Everton’s Player of the Month for February. The Club’s record signing has bagged 10 goals since the turn of the year, five of which were all scored last month. Lukaku registered the first hat-trick of his Everton career in the 4-1 away Europa League last 32 victory over BSC Young Boys, before hitting a brace in the return meeting against the Swiss side at Goodison. The Belgian international collected the award at a lunch at Liverpool‘s Hilton Hotel this afternoon, receiving his award from Ian Harvey of Williams BMW and designer watch on behalf of sponsors Welder Watches. The event was less than 24 hours after Lukaku had helped Everton overcome Newcastle United, where he scored the Blues’ second goal of the afternoon from the penalty spot. It followed on from the Toffees’ 2-1 success over Dynamo Kyiv on Thursday, where he was also on target from 12 yards in front of the Gwladys Street. Lukaku now has 17 goals in all competitions for the campaign and he says the Blues will head to Ukraine for the second leg later this week full of belief given their last two results. The Belgian said: “It’s special to win these types of awards but there is still a lot of work to do this season. “Everybody knows I want to win the Europa League and I also want us to finish as high as we possibly can in the league, so I will do my best to achieve my own objectives and the team’s objectives. “In the warm-up everybody was pumped up for the Newcastle game and as soon as we came out on the pitch I knew we would win. We won comfortably and now we have to look forward to the next game. “It was important to be 2-0 up because Newcastle are a good team going forward. As soon as we got the second goal we had more control of the game. We scored a third one – it’s always very pleasing for the fans to see goals.